While preparing a post on the cold-hardy cacti I'm growing in flower boxes on my balcony I stumbled upon this high-speed video I shot last summer. 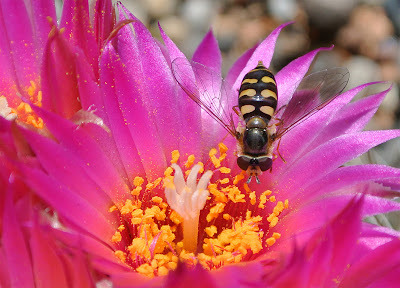 The video shows a hoverfly visiting a flowering Escobaria vivipara (Alberta, Canada). Hoverflies, sometimes called flower flies or syrphid flies, make up the insect family Syrphidae - a group of superbly beneficial insects, the adults being pollinators and the hoverfly larvae being predators of aphids and other damaging insect pests and their larvae. The coloring and movements of most species mimic bees or wasps giving them some protection against being eaten by birds. I’m by no means an entomologist and to my untrained eye the flower fly in the video looks like a Scaeva selenitica (a common European species of hoverfly) with its three pairs of yellow comma markings on the abdomen. If you are an expert on insects and recognize the fly I would be happy to know the exact species. If the above video doesn’t embed properly you can open it in a separate window by clicking the image below. The high-speed video was filmed at the end of June 2012 using a Nikon 1 J1 camera.